Oh lord. I sent Nick a text message (that I also tweeted, because I enjoy making fun of myself on the internet) that said: " I have to walk to class in the rain and the only umbrella in the car is a Buzz Lightyear one. All the other students will be jealous right?" Nick wrote back: "You can put a bag over your head and walk to class or use the umbrella and put a bag over your head when you get to class. It doesn't help that the bag is from Save a Lot." That husband of mine. He does make me laugh. I opted to go with the umbrella. You all, this thing was tiny. TINY! It BARELY covered my head. And I had to hold the handle all the way up near my face because it was so short. Sorta like it was made for a two year old or something. I actually saw several drivers take a closer look as I walked by, and then saw them laugh. Nobody in class mentoned my rockin umbrella, but several of them saw me come in with it. 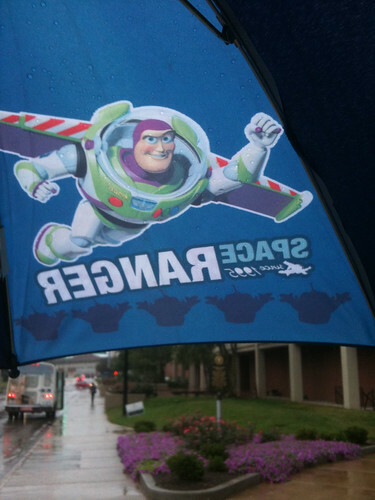 Nothing bands you as a mom faster than a Buzz Lightyear umbrella on a college campus. It's Monday again, and it's raining again. And I didn't get around to buying a grown up umbrella. Looks like I will have to break out Buzz one more time. No doubt about it. I am the coolest kid in school. Such a cute story! 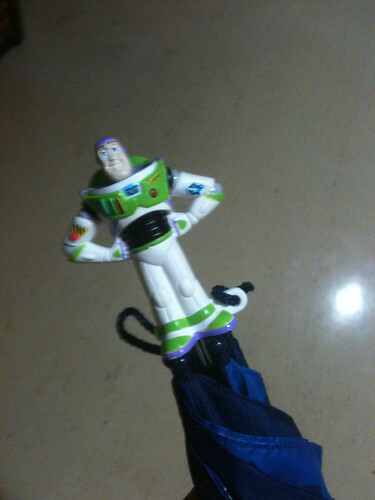 And, I actually have had similar fun times with a Lego Star Wars umbrella. If it makes you feel better, I had to use Evie's frog umbrella once... The kind with the eyes on top. I looked special.